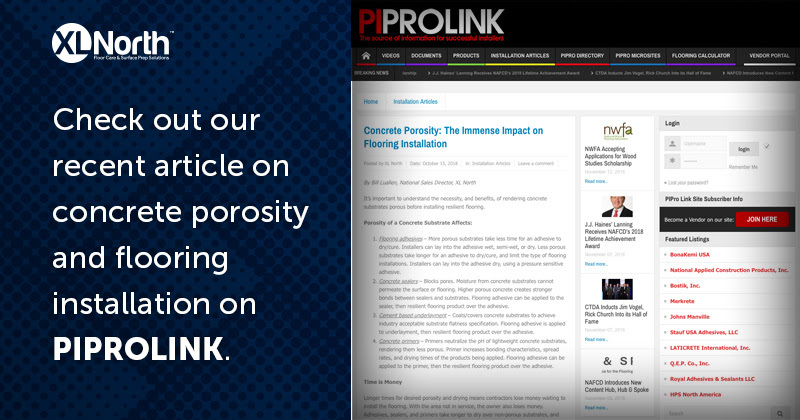 National Sales Director Bill Luallen of XL North, a subsidiary of TRCC, recently appeared as a guest writer on ProInstaller Magazine to discuss the impact concrete porosity can have on flooring installation. The porosity of a concrete substrate affects flooring adhesives, concrete sealers, cement based underlayment and concrete primers in various ways. Time is money, and the longer contractors have to wait to install flooring, the more money lost. Adhesives, sealers and primers take longer to dry over non-porous substrates. The “water to cement ratio” is the most important factor for mixing concrete because the denser and less porous the cement, the stronger it will be. Two tests that must be performed on concrete substrates at every grade level are moisture and pH testing. XL North has a solution to achieve porosity quickly and with minimal effort – Porosity+. For more information or to learn more about Porosity+, visit XL North’s website.